Immergiti nel mondo scintillante dei film di Bollywood in un tour di un'intera giornata a Mumbai. Inizia a visitare un luogo per le riprese per vedere l'azione, poi guarda dietro le quinte il lavoro tecnico di uno studio di Bollywood. Se il tempo lo consente, potresti vedere la stanza del trucco di un attore o posare per le foto con le stelle del cinema attuali. Guarda uno spettacolo di danza con tipico bagliore di Bollywood, quindi partecipa per imparare alcune delle mosse. Passa davanti ai palazzi di diverse stelle di Bollywood mentre ritorni al tuo hotel. Really fun tour! We got to take pictures in a studio, had an amazing lunch, and even ran into some celebrities! I had the most amazing tour and guide .. Sufiyan! Sufiyan went out of his way to show me all the behind the scenes of Bollywood studios. The day went so fast and I had a very up close and grand experience! 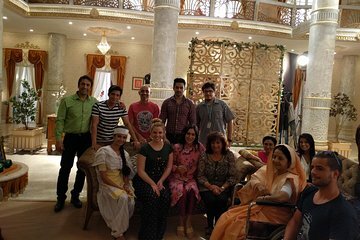 Great private trip that gave us a good insight into the ways in which Bollywood works. Enjoyed dancing exhibition and behind the scenes tours very much. Nice to se a different side of Mumbai. Our Tour guide Naren was very helpful and knowledgeable. We enjoyed the trip planned. IT WAS A GOOD EXPERIENCE!! BUT FOR THE PRICE, WE THOUGHT IT WAS MUCH EXPENSIVE. BUT TO TRAVELLERS WHO WANT A CLOSE ACTION TO THE SHOOTING FOR UP-CLOSE and PERSONAL TO THE BOLLYWOOD ACTORS, and HOW THE FILM IS MADE, IT IS WORTH IT. LEARNING TO DANCE THE BOLLYWOOD DANCE W/ A PVT CHOREOGRAPHER WAS FUN !!. Excellent! My tour guide was both friendly and informative. I would definitely recommend this tour. Loved it! The tour was great fun. Fascinating, private behind-the-scenes tour. Guide was on-time and very accommodating. He spent extra time getting us into live shoots.